The granddaughter of a former New Zealand Prime Minister and conservationist returned to New Zealand this month to rediscover family connections to the Great Walks of the South Island. Margaret Mackenzie-Hooson of San Francisco was delighted to find not only well loved family names, but also emerging acknowledgement of the original Maori explorers and history. Born in Balclutha but resident in the US since the 1960s, Ms Mackenzie-Hooson walked the Routeburn and Milford Tracks with premier guided walking company, Ultimate Hikes, following in the tracks of Sir Thomas Mackenzie – who briefly served as the 18th Prime Minister of New Zealand in 1912 before serving as New Zealand High Commissioner in London. Walking the tracks with Ultimate Hikes Guided Walks was a wonderful experience for Ms Mackenzie-Hooson, not only for finding the landmarks that her grandfather named for members of the family, but also to witness the public/private partnership between the Department of Conservation and Ultimate Hikes and the cooperation with Ngai Tahu. “As I walked on the Milford and Routeburn tracks, so skillfully cut and maintained, I am only too aware that I am hardly retracing the footsteps of my grandfather. I thought often of how first the Maori people, and then the early pakeha/European explorers had to search for passes through the mountains, make their own pathways, as they carried heavy swags--no water-resistant fabrics and no wonderful luxury of drying rooms to make their passage easier! “As a little girl, I had heard that Lake Ada was named after my grandmother, and Mt Cusack for my father. It has been thrilling to locate them on maps while I am actually in the region. While I’ve loved this part of the journey, I have also been pleased to note renewed interest and commitment to Maori history and explorers. Ms Mackenzie-Hooson left New Zealand to study in the USA completing her Ph.D. at University of Chicago in 1973. She then became a medical anthropologist at University of California at Berkeley 1973-81 before her career continued as part of the Alcohol Research Group at Berkeley; then California College of the Arts 1986-2006 as an anthropologist in 'Critical Studies'. She is now Professor Emerita teaching part-time at Fromm Institute at University of San Francisco, the NZ equivalent of University of the Third Age. “The small contribution I want to make towards knowing more about the Maori pioneers of Te Wahipounamu, as a mark of respect, is to discover what the Maori terms were for the landmarks that my grandfather named. Earlier this year, cousins of Ms Mackenzie-Hooson walked the tracks with Ultimate Hikes as the fulfillment of a lifelong ambition to walk in the footsteps of their ancestor. Bruce and Kiri Richards of Nashville Tennessee are Sir Thomas Mackenzie’s (1854-1930) great grandson and great great granddaughter respectively. The father and daughter pair walked the Routeburn Track with Ultimate Hikes in February to discover Sir Thomas’s historical legacy. Sir Thomas was a keen explorer, who pushed for the construction of the Routeburn Track during his tenure as Minister of Tourism. He believed tourism offered the best opportunity for conservation of the magnificent swathes of wilderness. Cutting of the famous route by Harry Birley of Glenorchy began in 1912, the year Mackenzie became Prime Minister of New Zealand. Sir Thomas’ name was used to commemorate Lake Mackenzie – a key landmark on the Routeburn Track. Ultimate Hikes, which operates multi day guided walks on the Routeburn Track, chose to continue this theme by honouring Sir Thomas for his exploration in the region by naming Mackenzie Lodge after him, located near Lake Mackenzie. 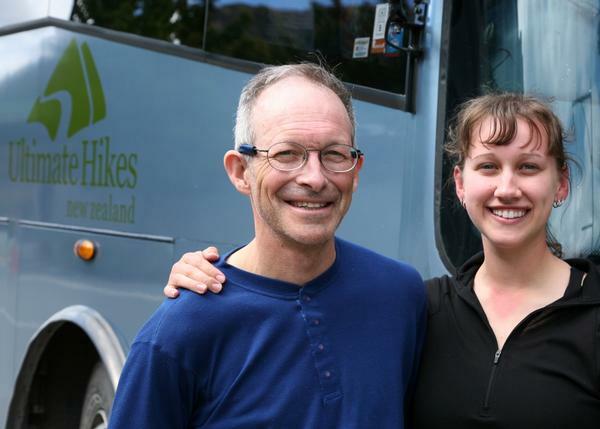 The Richards’ and Ms Mackenzie-Hooson follow in a long line of family members who have completed the Routeburn Track in honour of their predecessor. Bruce’s mother and grandmother have walked in previous years. The 2011/2012 Ultimate Hikes Guided Walks season opened on 1st November and will continue until late April. .